Linda is an attorney (and a former real estate agent!) who was severely injured on-the-job. 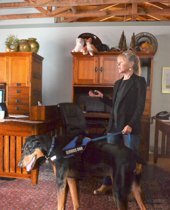 She now works and travels with her two PTSD service dogs, Zac and Ziva. * An Emotional Support Animal is a companion animal that a medical professional has determined provides a benefit for an individual with a disability. Service Animals and Emotional Support Animals may live with their disabled owners, even if a no pets policy is in place. Landlords are required to make "reasonable accomodations" to the owners of these animals. The Texas Association of Realtors has just issued new assistance animal forms for landlords and tenants to use in these circumstances. "Be aware," said Geffin, "that case law regarding assistance animals is evolving rapidly. Legal liabilites are severe and may involve both Federal and State penalties, up to and including $100,000 fines, legal fees, and incarceration. For anyone serving the public, training is needed to reduce the risks of an ADA violation."